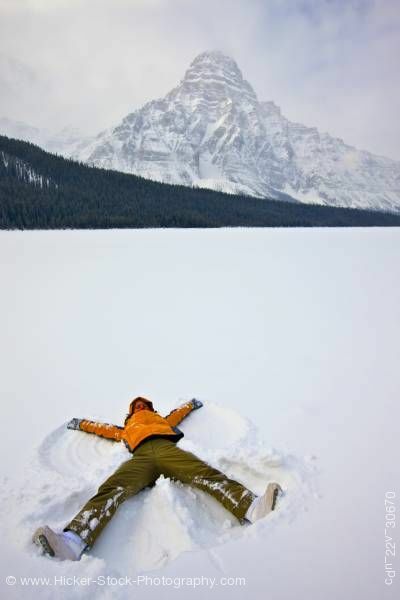 Stock photo of woman making snow angel on Waterfowl Lake after fresh snowfall with Mount Chephren towering into the background sky. Woman making a snow angel on Waterfowl Lake after fresh snowfall during winter with Mount Chephren (3307 metres/10850 feet) towering above, Icefields Parkway, Banff National Park, Canadian Rocky Mountains, Alberta, Canada. Banff National Park forms part of the Canadian Rocky Mountain Parks UNESCO World Heritage Site.